We are delighted to be able to support the Heal Nepal campaign. Especially as thanks to UK Aid Match the UK government will match all donations made to The Leprosy Mission from 27 January to 27 April 2019! There are thousands of cases of undiagnosed leprosy in Nepal today, leaving many disabled and shunned because of stigma and fear. For them, Anandaban Hospital is a lifeline. The Leprosy Mission’s team there trains local community leaders to find people affected by leprosy and get them the cure, but they also provide surgery, physiotherapy and prosthetic limbs so people can regain their mobility and reclaim their income. People with leprosy are often hidden in remote villages, and a gift from you this World Leprosy Sunday will help local workers to find people and get them the cure before leprosy takes hold. For those who have already been seriously affected, your gift will bring them to Anandaban for treatment. By finding cases early, we will prevent disability, stop leprosy spreading and bring real hope of seeing an end to this ancient disease forever. And when you give before 27 April the UK government will double your gift. By giving to cure one person from leprosy, your gift will transform TWO lives. Basu receives regular ongoing treatment for the effects of leprosy at Anandaban Hospital. She contracted the disease when she was around 10 years old and without the cure or knowing how to care for her hands and feet, she became permanently disabled. While all her friends married, the stigma of leprosy meant that Basu remained single. Many years later she met and married a man who also had the disease. The couple’s three children all died young and eventually they adopted a young boy. 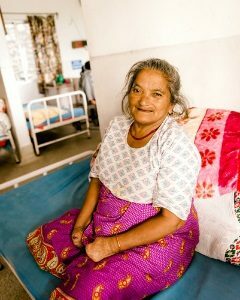 When the earthquake hit Nepal in 2015, Basu and her family managed to escape their home unhurt. But shortly afterwards, her eight-year-old son became ill and did not recover. At Anandaban, Basu has received physiotherapy and ulcer care as well as counselling and loving care to help her overcome all that she has faced. “This is my maiti,” she told us. It’a a word meaning ‘my mother’s home’ – Basu sees Anandaban as her family home, a place of love and welcome. This rare opportunity for you to double your gift means that we can help transform the lives of more people like Basu. When you give before 27 April, your support will go twice as far to provide life-changing care.